Anybody remember Google’s first April Fool’s joke? I’ll get to that in a second. Quick hint is Steven Levy’s observation that the real Google April Fool’s joke was that “even the scariest plans that Google joked about were the kind of thing that Google’s leaders actually dreamed about.” Google is obsessed with artificial intelligence. Giving you the web page for which you searched is only the first use-case which Google solved. They’re already past that. Giving you information that you want even before you search for it. Not just delivering information, but performing actions for you. Taking inputs not just from what you type into a search box, but also from where you are, where you’re going, and what you’re doing, planning, or looking at. Giving results not just from information published by others on the web, but from everything it learns about the world. Gone “from strings to things.” Instead of just considering keywords, Google increasingly understands the world’s objects and the relationships between them. Knowing you better than your mother does. And better than you know yourself. So the people who talked about Search Engine Optimization dying were partially right. Optimizing for Google is becoming much bigger than getting a site to rank high in search results. Also, many of the older SEO tactics no longer work. Google Glass is amazing. And it’s not science fiction. A developer version should ship this in about two months and next year they expect to launch to consumers. In Google’s video presenting the product you’re trying to buy a book about playing the Ukelele. You start walking to the 6 train and Google tells you that service is suspended. It asks if you want walking directions or public transportation directions, you choose walking directions. It even gives you directions inside the store. You find your book. Apparently in Google’s perfect future the only thing not digitized are books. My daughter learned to play the ukulele from a Google product called YouTube, but, whatever, you were wearing the futuristic glasses but feeling retro. Your glasses tell you that your friend, or your stalker, or your stalkee, is right outside the store. A few hours later you’re playing the ukulele for the cute girl while showing her the Hudson skyline. Perfect date for geeks and Orthodox Jews, all the benefits of being with the cute girl without any of the ickiness of physical proximity. Leave it to Google to create this perfect technology and to use it to go to a bookstore instead of to your girlfriend. But I digress. Marissa Mayer is now CEO of Yahoo! But before she went purple she was a key figure at Google for over a decade. I heard her at a conference and she told us that she almost missed her flight because of a traffic jam on the way to the airport. Why, she asked, didn’t her Android phone warn her? Her phone knows her schedule. It knows the current traffic and it knows when rush hour is. It can know about flight delays. Why couldn’t it tell her that there was an accident on the 101 and I should leave my house a half hour early? Marissa was VP of Local and Maps at the time, so she wasn’t just day dreaming, she was telling us of the vision Google was pursuing. Google’s vision doesn’t end with giving information. It’s also going to be powering machines. They have driverless cars. They put an engineer in the driver’s seat just in case, and to not freak anybody out. They set in on a crazy 1,000 mile obstacle course that ranged from highway driving to a one-lane road where if somebody was coming the other way you had to back into a driveway and pull back out. It drove over 300,000 miles and the only accident was when it was rear-ended at a traffic light. Google also built a neural network and told it to watch YouTube videos and start classifying the world. One pattern that it noticed was cat faces. This was considered a big breakthrough because they didn’t tell it to find cat faces, just to start recognizing patterns. And it sort of discovered cat faces. Somebody called it passing the purring test. The New York Times got snarky with a headline of “How many computers to identify a cat? 16,000.” It was actually only 1,000. So the New York Times was off by a factor of 16. Which is good for them. Google’s founders Larry Page and Sergey Brin have always been obsessed with artificial intelligence. There are more Google AI quotes at Artificial Brains. And they’re building that laboratory; it’s called Google X Lab. They’re allegedly working on over 100 products, including the glasses and the driverless car and the Android Assistant that’s like Apple’s Siri and that’s supposed to be the core of that vision that Marissa Mayer articulated. They also have a Web of Things project that companies like Texas Instruments and Broadcom are allegedly signed on for where you can control all your gadgets remotely. So you can turn on your coffee machine or make sure you turned it off, or whatever. And we’re probably not far from your car can telling your air conditioner that you’ll be home in ten minutes. Combine these and a little imagination and Marissa Mayer’s vision and it’s not just your cellphone telling you to leave early because of traffic on the way to the airport. It’s landing in a foreign city and Android taking care of your driverless rental car and knowing whether or not it should get the liability insurance and driving you to the Kosher restaurant that your friend liked and suggesting evening entertainment and then taking you there. They’re also allegedly working on some really crazy stuff involving robotics and a space elevator which all sound like science fiction but maybe isn’t any more. Sergey Brin runs the lab, with Larry Page also very involved. Two months ago they hired Ray Kurzweil, who is one of the most talented and ambitious artificial intelligence visionaries. Error 666: Multiple transmitters detected. Silence voices in your head and try again. Error: MentalPlex(tm) has determined that this is not your final answer. Please try again. 3. 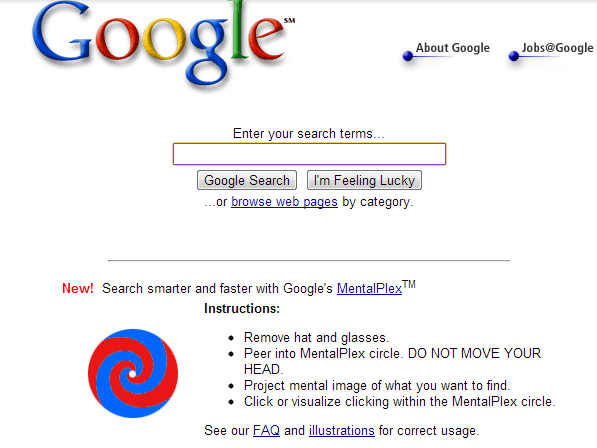 Does MentalPlex search read minds? Don’t be ridiculous. Mind-reading is impossible. MentalPlex technology senses electronic field variations created by concentrated thought and can interpret those field variations as broad categories of content. Mind-reading? Really now. We’re talking about science here. I love that one because it’s thirteen years later and I’m a little lost about the boundary between fiction and reality. Google can’t read my mind. But it knows an awful lot about my thoughts and desires. Google Glass will see what I see, and hear what I say. Pretty soon Google will know my schedule, my search history, my browsing history, where I am, where I’ve been, where I’m going, who my friends are, what I like, and whether or not my coffee is ready. Oh, and by the way according to the patent application filed two weeks ago Google Glass will transmit sounds through bone conduction rather than speakers. So they’re already messing directly with your skull, but for now only to implant sounds. “The vibration transducer is configured such that when the head-mounted display is worn, the vibration transducer vibrates the head-mounted display without directly vibrating a wearer.” So that’s good, it doesn’t have to vibrate you, it just “couples to” your bone structure. This isn’t just a Google thing, BTW, it’s the hot new technology. It sits near your ear, couples to your bone, and it doesn’t block out ambient noise. Which is a good thing if you’re crossing the street. Won’t catch on with everyone. For my kids, still being able to hear me would kind of ruin the whole point of wearing headphones. My point is that Google knows a hell of a lot more about me than I do, and it’s going to be directly messing with my brain. So they can’t read my mind. At least not yet. But they seem to have worked around that. BTW, I’d be remiss if I discussed the future of Google without linking to this great post by AJ Kohn about Google’s not so evil plan to get people to use the internet for everything all the time. Let’s go through some of the things that are changing, and their implications. Only three years ago if you asked Google questions like “do your search ranking algorithms consider social signals” they would tell you no. Certain signals were just too easy to spam, had too much noise, weren’t reliable. Google now uses everything. The biggest breakthrough of the Panda and Penguin updates, in my opinion, was that Google for the first time said “OK, we’re smart enough, we’re going to look at everything.” Google decided they had enough knowledge to take all the signals they could and mash them together and decide which signals seemed phony and which seemed real. Matt Cutts advised webmasters that “it’s much easier to be natural than to fake natural” and most of the former black hat SEOs are agreeing. SEOs who made their living using clever tricks to fool Google have generally turned away from the dark side. Unless they’re really, really good. One thing that matters a lot more than it used to is user engagement. We were working with a site that had a projection of Bill Clinton’s speech at the Democratic National Convention. After the speech, we noticed in Google Analytics that we were getting a lot of search traffic for “Clinton DNC speech.” I should have anticipated that, but I didn’t. That’s why we look at Analytics. The people searching for Clinton’s DNC speech were probably looking what he actually said, not to what somebody thought he was going to say. We were probably dissatisfying a lot of users, who were going back to Google and clicking on a different result from the same search results page, implicitly telling Google that we failed them. Now this was an easy problem to fix. We updated the entry, by embedding the YouTube video of the speech, a link to the transcript, and links to reviews from a liberal who loved it and a conservative who hated it. Took maybe five minutes. Turned the page from being yesterday’s news to an evergreen snapshot of a historic event, with the original content still there but below the fold. In the old days, I might have just said “our page isn’t satisfying the user? Fine. Let’s monetize him. Or try to get some other benefit from him. Get him to sign up for a newsletter or click on a different link. Or we can ignore it and focus on our other opportunities.” But not any more. Google cares very much about “pogo sticking,” the people who bounce back to the SERPs and try a different link. First step now is to prevent a dissatisfied user from pogo sticking. Mahalo used to prominently promote their page on how to get coupons from McDonalds. They ranked #1 for it for a while. The extra beauty of the page was that it had all the right keywords but was completely worthless so you had to click through on the AdSense ads if you still had hope for a coupon. Those kinds of strategies worked for a while. Now they’re poison. Mahalo got crushed by Panda. Google is now using something called a document classifier to help determine which sites are better than others. Basically you look at everything you can about web sites, and you ask which attributes correlate with user satisfaction. For example, do you know how the New York Times usually refers to the former first lady, senator, and secretary of state? Hillary Rodham Clinton. Ten years ago already the Google News team noticed that the better news sites usually included her maiden name when referring to her. Does using her maiden name make you a better site? I don’t think so. But Google’s document classifier might. Do the things that good sites do, and avoid the things that bad sites do. Whether those things are objectively good, bad, or neutral. If I were running a site with user generated content, for example, I would strongly encourage correct spelling, capitalization and punctuation. Because the New York Times doesn’t have comments that are all misspelled and in lowercase. Google gave the examples of New York Times, Wikipedia and the IRS as sites that you should emulate. When is the last time you heard the IRS mentioned as a company to emulate? I was at a conference and an audience member asked “Should I buy links?” My co-panelist and the moderator laughed and said no. I always get suspicious when the answer is too simple that maybe we’re over-simplifying. Here’s the thing. Buying a link can be great. If you buy one. From a trusted site in your niche that can really bestow authority upon you. And preferably not a straight purchase, and definitely not one that leaves a paper trail. But something indirect, or barter, for example a charitable donation, or some other thing you can do for them that might persuade them to link to you. The general rule here is that any tactic that can easily scale has probably been ruined by aggressive SEOs. And Google’s getting smart enough and aggressive enough that tactics that scale easily usually backfire. So don’t buy thousands of links. Intelligently acquire one or two. And whenever you see somebody doing something in bulk, it’s probably a bad idea. In addition to optimizing for keywords, we’re now optimizing for concepts. We need to somehow tell Google what we are, not just what keywords we match. Similarly, Orlando isn’t just a word any more, it’s an entity with a specific longitude and latitude. Google knows our potential customers’ friends and what they liked. The ultimate decision may sometimes be made by an automated agent like Siri or Android Assistant. Freebase is a large, collaborative database that Google now owns and uses for its Knowledge Graph. It gets information from Wikipedia, IMDB and many other sources. They have APIs so you can write to it directly. You also influence it when you fix something on Wikipedia, especially in an InfoBox. Schema.org gives you another way to give Google structured data. For example, we’re selling Naïve Art at Naïve Art Online – they make great Valentine’s Day presents, by the way – so we marked up the paintings using schema.org. Google has been somewhat confused with Google Places and Google+ Local. I don’t know exactly where they’re going. But if you want people coming to a certain physical location, it’s critical to get yourself listed with them. The social graph is very important. If somebody comes to your business, try to find a way for them to recommend it. Get their e-mail address and find excuses to send them an e-mail, with a special offer or something. Or appointment reminders. And include a link to like you or recommend you. This isn’t just important for Google, it’s also important for Facebook which is releasing their social search. Find ways to get your customers to like you in social media. The internet was once a tool of anonymity, a place where nobody knew you were a dog. It’s going the other way. The web is about identity and relationships now, not anonymity. The internet is not where you live your second, virtual life. You need to establish your identity. Every year somebody declares that search is dead. Search may be decreasing in importance. That is, Google and SEO are becoming about a lot more than performing a search. Google is going to be getting a lot more proactive, and it is going to be using far more inputs than just text in a search box. Search isn’t going to die, but other things are becoming more important. And Google and SEO are in my opinion going to continue growing for the foreseeable future. A tremendous amount is changing as Google is acquiring science-fiction like knowledge and power. And yet, and yet. Remember the Flintstones and the Jetsons? Two TV shows set millions of years apart. But they were pretty much the same show with different gags. Yes, there are things that are plenty of things that change in SEO, but most of the fundamentals remain the same, and indeed many of the principles of marketing have remained the same since Fred Flintstone and Barney Rubble tried their first money-making scheme. I don’t mean to overstate this point, because, yes, you should be paying attention to how a lot of important things change. But a kiss is still a kiss. Unless it’s on a virtual date using Google Glass. Note: This is a presentation I gave at SMX Israel (lightning version) and at MegaComm. Here’s the video and the Slideshare.